Covered by the Wall Street Journal this week, Time Warner Cable is continuing to bleed video subscribers and the growth of Internet subscribers has slowed significantly. Specifically, Time Warner Cable lost 217,000 video subscribers between October 1, 2013 and December 31, 2013. Comparatively, the company only lost 129,000 video subscribers during the same time period of 2012. In addition, the company added 39,000 Internet subscribers compared to adding 75,000 during the fourth quarter of 2012. Voice subscribers also plummeted from 34,000 during 2012 down to just 1,000 this year. While these numbers are somewhat skewed due to the blackout spat between Time Warner and CBS during summer 2013, the overall numbers for 2013 show a massive decline in subscribers. Time Warner lost 532,000 video subscribers in 2012, but that number grew to a 833,000 loss during 2013. While Time Warner is still gaining Internet subscribers, that growth number shrunk from 433,000 in 2012 to 154,000 in 2013. Calling the new service “TWC Maxx,” executives will start by targeting New York and Los Angeles markets, specifically “West Hollywood and Costa Mesa in California, and portions of Woodside (in Queens) and Staten Island in New York.” The network in Los Angeles will also be converted to an “all-digital” format, thus getting rid of the analog channels and freeing up more bandwidth for these speed improvements. Arguably, the speed improvements are likely an attempt to upgrade before a service like Google Fiber comes to town. For instance, customers that currently subscribe to the standard 15 Mbps download / 1 Mbps upload package will be bumped up to a 50 Mbps download / 5 Mbps upload connection for the same price. 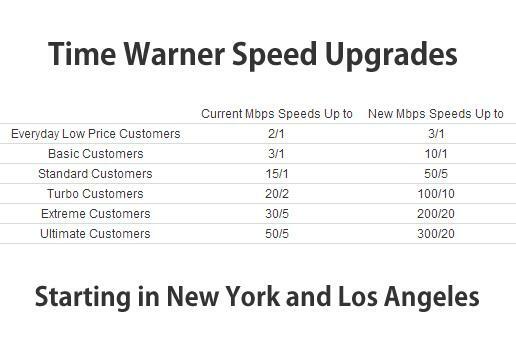 Alternatively, customers already paying for that speed will by bumped up to a 300 Mbps download / 20 Mbps upload connection within the Ultimate package. Regarding set-top box improvements, the company will be launching new hardware during 2014 that will allow subscribers to watch and record up to six different channels at the same time. In addition, recording space for programming will be increased up to 12 times depending on video quality. The company is also planning to expand the on-demand content library to more than 75,000 hours. Of course, this infrastructure investment plan is likely a response to Charter’s aggressive attempts to takeover the company. According to the Chicago Tribune, Charter is considering raising the bid for Time Warner Cable within the next two weeks, basically pressuring investors to make a decision. Charter’s interest in Time Warner Cable is mostly focused on the New York market as well as pockets of the New England area. Alternatively, Charter doesn’t have a interest in Time Warner’s Los Angeles customers, thus that portion of the business could be sold to a competing cable company.